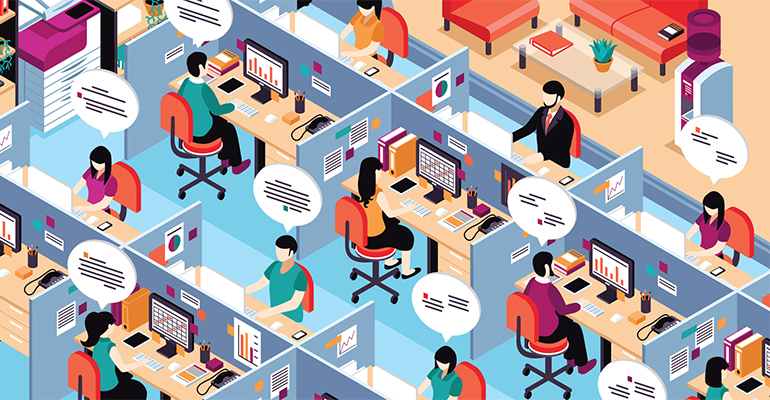 Workplaces across industries have sought to streamline communication and promote collaboration between employees through internal messaging platforms. Could these services be useful for your bank? Few people in the 21st-century workplace have escaped the dreaded email chain with too many recipients, no ability to track input through exchanges and the inevitable morphing of subject matter while the subject line stays the same. And just try to pull together a functioning team from employees separated by schedules, locations and even time zones. In the past decade, various internal communication and collaboration platforms have emerged that are designed to improve productivity and communication in the workplace. These platforms create an internal hub where employees can access projects, centralize their communication and work together. Collaboration platforms eliminate switching between email and the application where you get work done. File sharing, chat rooms and instant messaging make it possible to make changes to a project directly and transparently. Typically, internal collaboration platforms combine several features. They can be divided roughly into two types: platforms that excel in communication and emphasize capabilities such as video conferencing, meetings, screen sharing and instant messaging; and platforms that excel in project management and emphasize capabilities such as filesharing, instant messaging, task assignments and chat rooms. Microsoft Skype for Business and Google Hangouts Meet are examples of platforms strong in communication. Of the many competitors in the project management space, some of the most widely used include Quip, Slack, Trello and Wrike. Most platforms are accessible by a number of devices, usually a desktop, tablet and smartphone. Nearly all of the platforms are cloud-based or have a cloud option, so there is no cumbersome software installation or server-capacity issues. Community banks may stand to benefit from these capabilities. For instance, suppose your loan officer in the field needs information for a customer. Rather than having to pause the conversation and pick up the phone, “the loan officer can fire off the question to someone in the back office who can quickly supply the answer,” explains Matthew Speare, chief information officer of $4.3 billion-asset Carter Bank & Trust in Martinsville, Va.
Like any purchase, when choosing among possible platforms, first define your community bank’s business need. For example, do you primarily need more real-time communication for your team, or a better visual display of project tasks? Defining that will ensure you’re investing in the right tech for your needs. Collaboration platforms: Is there an impact on compliance? Many collaboration platforms are searchable, which can be an asset in dealing with regulators. With all of your related documents on one platform, and the capability to search and extract information, you can demonstrate how your bank came to a decision, down to providing meeting minutes and who gave what input when. However, just about anything related to banking has regulatory implications, and collaboration platforms are no exception. As with email, it’s critical to establish bank-wide rules for platform use. The first rules should be: no customer information on the platform and no customer communication via the platform. These tools are for internal collaboration only.